Speech Language City: Movie of the Week: "Boundin'" - Teaching Theme With Pixar! Movie of the Week: "Boundin'" - Teaching Theme With Pixar! Over the summer, when I had many more hours to spend browsing Pinterest, I stumbled across some pins by smartypants teachers and SLPs who were using Pixar short films to teach language concepts (inferencing, main idea, etc.). Of course I fell into my usual habit of re-pinning the ideas but never doing anything with them... Until now, that is! A few weeks ago, I was struggling to get my third graders to grasp the concept and I was reminded of the idea. We reviewed the concept of inferencing with an anchor chart, and then I introduced the Pixar short, "One Man Band." The kids LOVED it and were able to apply the skills we've been building in a more sophisticated way than I had seen in our more traditional activities. I'm sure you've observed the same thing - Something about the computer screen always bring out their best effort/work! :) It is important to note that One Man Band is a wordless story. I think the removal of language comprehension demands from the task really helped to strengthen the students' understanding of inferencing without getting bogged down in reading/comprehension. Comprehension is of course very important, but it was nice to parse it out of this activity to isolate inferencing and verbal expression. Inspired to use these videos to target other skills, I searched YouTube for some more Pixar shorts. I discovered a ton of them with huge potential speech/language therapy! These films are perfect for speech/language sessions in the schools because they are only a couple minutes in length and generally have really rich characters and story lines. As you know, I've abandoned my "Book of the Week" project (at least for the time being)... I am so inspired by the potential for using these videos in therapy that I've decided to reprise my "--- of the week" post as a "Video of the Week" feature. I'll put together a more formal post on One Man Band for next week, but the one I'm sharing with you today is entitled "Boundin'," created by Bud Luckey (2003). This short was shown with Pixar's The Incredibles in theaters. We began the lesson by reviewing what we've learned about inferencing in the previous weeks and an introduction of theme. I used the wipe-off board to take notes as the kids volunteered their definitions for the term "inference" and what they remembered about "theme" from their class discussions. Then, I highlighted the important concepts and filled in any holes in the discussion: "An inference is a guess based on (1) What you already know from your own experiences and (2) Clues from the text/picture [I saw you guys coming inside today with coats and hats on so I inferred that it was cold outside. I wasn't outside when you were so I can't say for sure, but this is a pretty good inference because (1) It was chilly when I came in to school about an hour before you guys and (2) I know people wear warm clothes when it is cold out]." Moving on to theme... "You remembered that a story doesn't just tell us what the message or theme is; we need to use our good inferencing skills to find it. Remember that we also talked about how the theme is really THE MEssage. Can you think of any examples of a theme you might find in a book? Awesome! Okay, now let's talk about some other common themes." I just love these worksheets/graphic organizers from Scholastic. After our introduction, we read through the definition of theme on the "Theme Worksheet." I covered up the answers in the example to check for understanding. After that, I had the students work in groups to match common themes with their definitions (I just cut apart the common themes and definitions from the Scholastic worksheet). We tried to come up with an example of a person (someone you know in real life or have seen in a movie/TV show) who embodies each trait. This was tricky for the students, but they enjoyed the challenge. 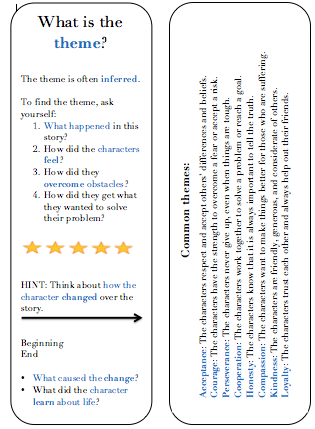 Next, I introduced the "Searchin' For A Theme" worksheet. I gave each student a copy (in a sheet protector with a vis-a-vis marker for note-taking) and we started the movie. I stopped the movie every few seconds to (1) review vocabulary (e.g., bounding, jackalope [it was helpful to pull up some Google images of "real" jackalopes since this was a totally new word for my guys], preen, coat, mope, etc. ), (2) Make predictions and inferences (e.g., Why is the sheep so happy? We know that there will be a problem in this story... What could happen next? Did you hear that sound? We know the sheep loves his fur coat... What could that sound mean? ), (3) Discuss character traits, (4) Remind students to fill out their graphic organizers. 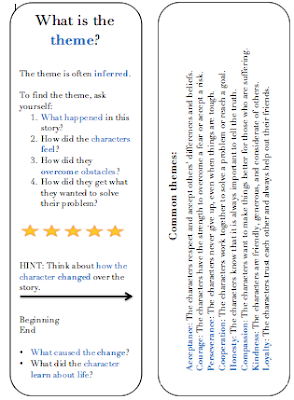 Finally, we wrapped up the lesson by reviewing what we learned with a theme bookmark that I made for them. I printed it on heavy paper then cut and glued the two sides. Grab your copy here!